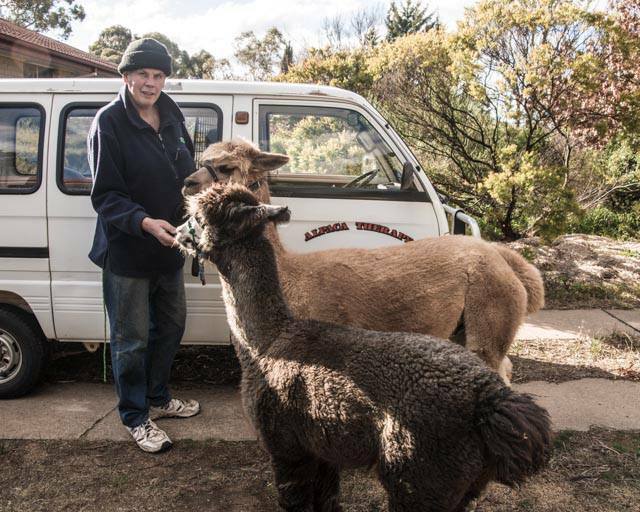 Nils Lantzke with two of his trained therapy alpacas. Photo: Supplied. Last night an unleashed dog savaged Mimosa the therapy alpaca, breaking both her front legs, biting to the bone and injuring the terrified animal so badly that she had to be euthanised. Nils says the most shocking thing is that while the attack was taking place the dog’s owner filmed it on his phone. Nils and a friend were walking Mimosa and Hercules on the bike path adjacent to Baldwin Drive in the Canberra suburb of Giralang at about 6.45 pm when they saw a man approaching with an unleashed dog described as “a black Staffy”. Nils and the alpacas moved onto the grass to avoid the dog but the owner approached despite being asked to keep clear. “The dog launched into Hercules first. He’s still a young one and he went into classic attack mode on his hind legs with his front legs folded up. I was yelling at the bloke but he wouldn’t do anything, he had his phone out. The badly injured animal ran away and but nearby residents helped Nils to track her down. “She was lying on the grass at the end of our street in terrible pain. There was a lot of blood. I got a blanket to cover her because of the shock while we sat with her and called the vet. Mimosa’s injuries were devastating and she was euthanised last night. This morning, Nils and his wife took her to a friend’s farm where she’ll be buried, leaving rosebuds with her body. “She was like my daughter and Hercules is my adopted son. I bought her six years ago and she was wild as anything. I suggested to the owner that if I trained her for therapy work, she’d be more saleable, but after I’d worked with her I didn’t want her to go to another home, so I put her on layby and bought her as a Christmas present to myself. “She did all that work at the hospice and in the mental health unit. There are young women in there who have been through dreadful stuff, and they don’t talk when they come in. They’d take Mimosa for a walk and she’d start them talking. Nils says that Hercules has been badly frightened by the attack and slept near the gate last night, hoping Mimosa would come home and crying out for her. At 66, he’s devoted to helping others although he concedes he’d sometimes like some help with walking the animals and caring for them. Nils says he is “eternally grateful” for the support and care the community has shown him. Alpaca Therapy has appealed for anyone with information, including anyone who sees the video of the attack, to let them know or contact Domestic Animal Services. I’m not a dog person; but I think it’s more exact to say I’m not a dog person person. I’ve been attacked and my son has been attacked, on separate occasions. I don’t trust dogs because I don’t trust humans. Its the owners teaching their dogs to attack. It’s as simple as that. Please tell me both the dog and owner have been put down! Surely this is a criminal act? OMG that is so wrong, shoot them both (dog & owner). how sad, my heart felt feelings are headed your way. what a great job you are doing to help those less fortunate. shallow words probably because I can't get over the shock you must have been thru. Pack of dogs dangerous no matter what breed Fancy the owner taking no action and filming it as well he needs a good kick up backside just for starters. Sad for the owner of the therapy alpaca too. So terrible! I hope they find the dogs owner. Staffies are usually big softies...it's their humans who are the problem. Sad to think the dog may have to die due to it's moronic human...shameful!! Margaret Shaw may be true BUT I had an incident where my next door black Staffy attacked my partners dog through the paling fence, tore his foot half off, I rang Ranger, dog put down. Our dog had numerous stitches... I do not trust those dogs at all.